Since its inception, our FREE Universal Orlando 12-month crowd calendar has been viewed over two million times. Just to put that in perspective, about 25 football stadiums’ worth of people have utilized our calendar to get a better idea of how much planning they need to do for their trip to Universal. Countless readers have reached out and told us how much of a valuable asset our crowd calendar has been for their trips, some even using it on a weekly basis. Given these humbling feats, when looking for the first area of our site to enhance with some 2016 technology, it became immediately clear we had to start with our crowd calendar. Enter George Reason, the latest addition to the Orlando Informer team. What’s new on Orlando Informer’s Universal Crowd Calendar? Weather: On the main crowd calendar view, you can see icons indicating the weather to expect for the next 14 days. Click on any date within the next two weeks to see a detailed description of the weather, along with the specific chance of rain and high- and low-temperatures. Checking on a date farther than two weeks away? You can still see an estimated high and low temperature, along with the average rain for the month. The calendar is backed by a wide range of data sources (up to 15! 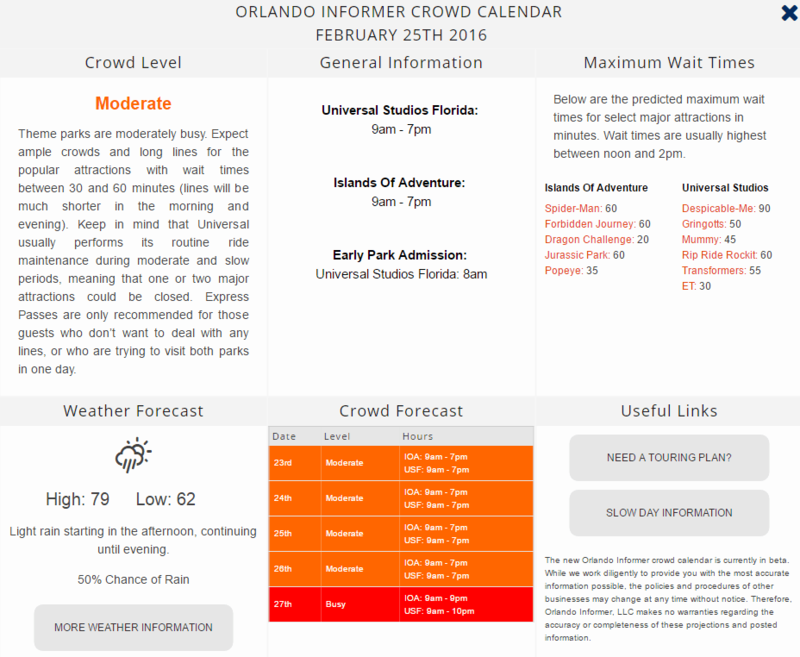 ), aggregated together statistically to provide the most accurate forecast possible for Universal Orlando. Increased accuracy: For the past five years, we’ve manually created each and every month of our crowd calendar (that’s 60 months, for those counting at home). While there’s no one more experienced than us when it comes to predicting Universal crowds, we still made mistakes from time to time. That’s why, for our new crowd calendar, we’ve implemented an advanced algorithm backed with self-learning technology for the crowd predictions to take place automatically and more accurately than ever. Our server updates hourly to provide the most up-to-date information and predictions possible. 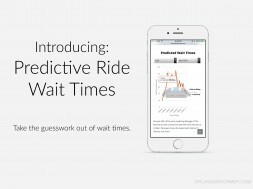 Expected wait times: Click on any date to view our predicted peak wait times for select popular attractions at both parks. These wait times will normally occur between noon and 2:00 pm. Dynamic content: When clicking on a date, you’ll see only information that is beneficial for the specific day you’re visiting, including individual park hours, which park is hosting Early Park Admission, suggestions for planning pages specific to the crowd level, and more. You’ll also see how the crowds look for the dates near your visit. Responsive in every way: Whereas our old calendar was hard to see on mobile devices, the new calendar is now responsive for every type of device, from your desktop computer to your iPhone to your carrier owl*. Even better, it’s built to load quickly, no matter your internet speed. * Animal care rates may apply. What hasn’t changed on Orlando Informer’s Universal Crowd Calendar? One thing remains the same: just like every other page in our next-generation encyclopedia of obsessively-updated Universal Orlando planning, our 12-month Universal Orlando Crowd Calendar is absolutely free. Our new crowd calendar is just the beginning of enhancements coming to the site in 2016. Keep checking back for further developments from George and the rest of our team at Orlando Informer. 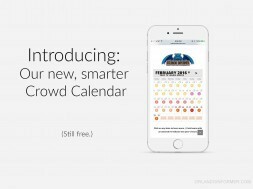 Want to hear more about the new crowd calendar? George joins us on Episode 34 of the Orlando Informer Podcast to discuss the new feature. 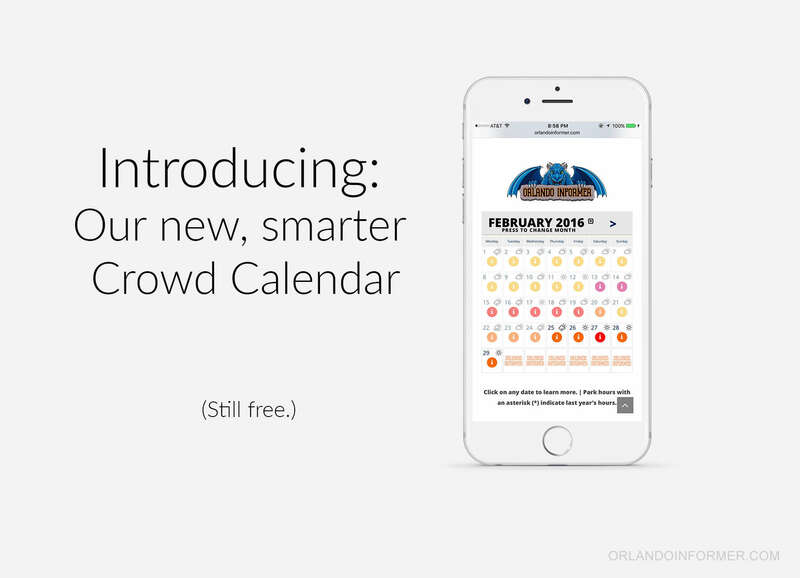 We’d love to hear your feedback on our new crowd calendar on the OI Forums or via email: contact@orlandoinformer.com. 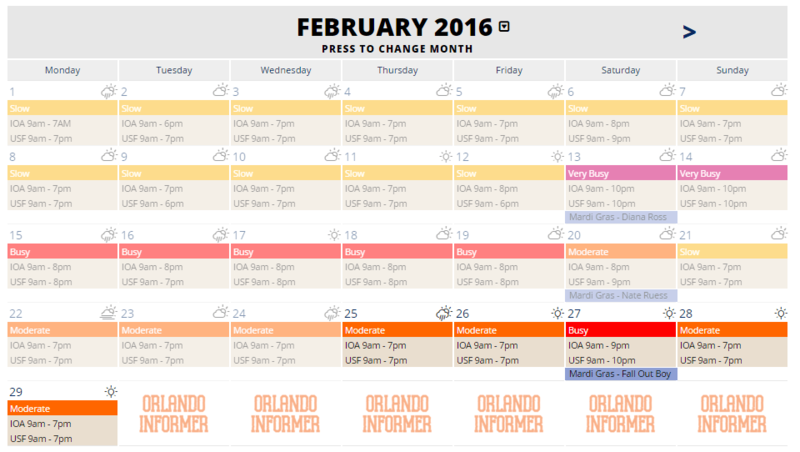 Please note: The new Orlando Informer crowd calendar is currently in beta. While we work diligently to provide you with the most accurate information possible, the policies and procedures of other businesses may change at any time without notice. Therefore, Orlando Informer makes no warranties regarding the accuracy or completeness of these projections and posted information. Universal Orlando publishes their spring hours, and they reveal a few surprises! Special needs are Universal: Traveling with two disabled children – how to best prepare for Universal Orlando?